If you look closely, you'll see that the groves flow in one continuous line. I am delighted with how it looks on the top. The back looks great, too! 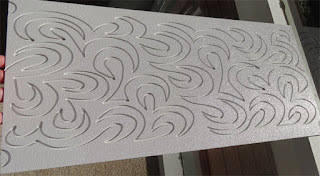 the three groovy board designs. 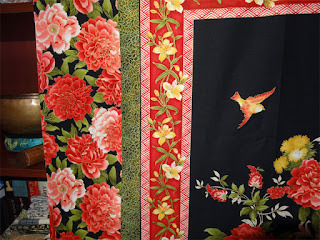 I learned a few things while doing this quilt. 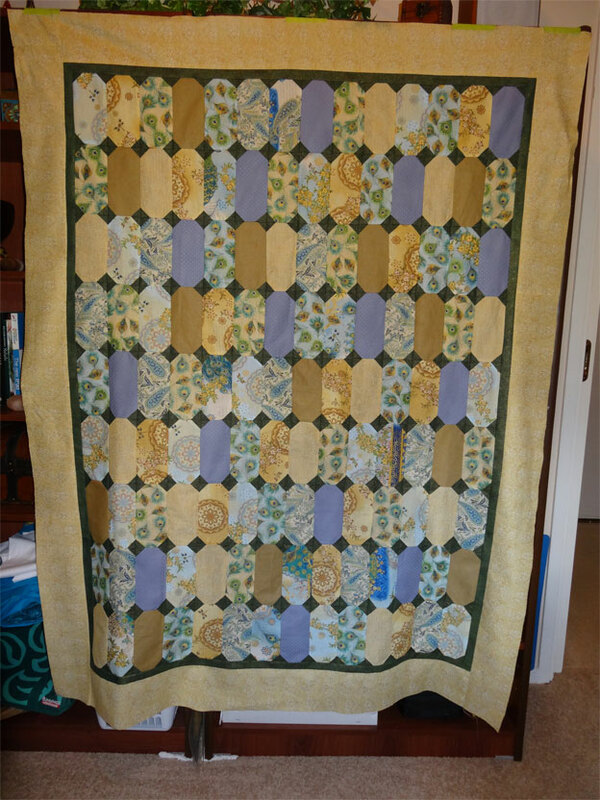 I mounted the quilt with the upper edge being quilted first. 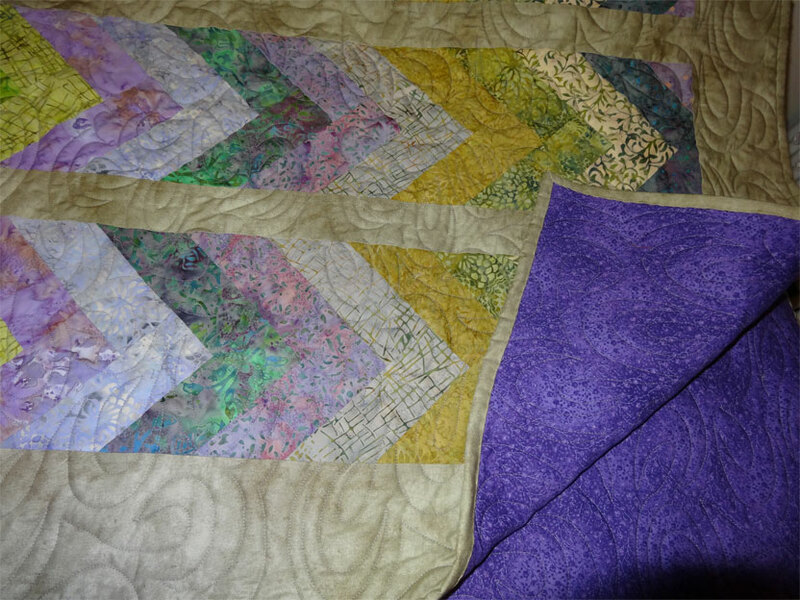 That turned out to be a mistake, but I didn't realize it until I got into the stitching. The boards have an "alignment mark" - a line under the bottom of the fans. 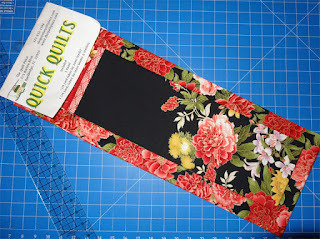 The point to that line is you're to use it to line up the next row of stitching after advancing the quilt on the frame. 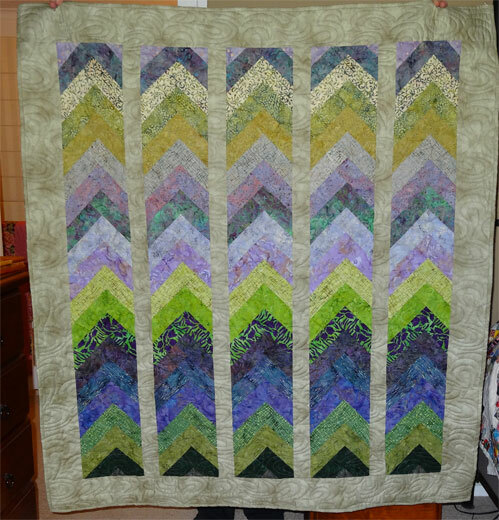 Because I started at the top, that line wasn't in the right position when I advanced the quilt. 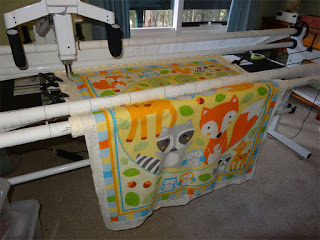 I had to line up the stitching rows without the use of that handy mark. I did OK, though. The rows aren't EXACTLY the same distance, but nobody is ever going to notice that. The next time I use these groovy boards, I'll mount the quilt upside-down. That way I'll be able to use that alignment mark as it's meant to be - and should be able to get near-perfect rows. 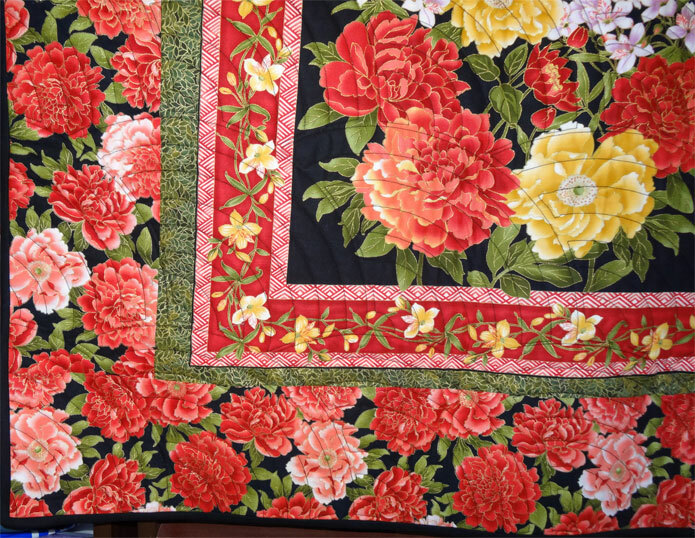 There are three different fabrics in the kit - the printed panel (Chinese Peonies), a small amount of green (to border the panel - showing below), and a large peony print for the outer border. 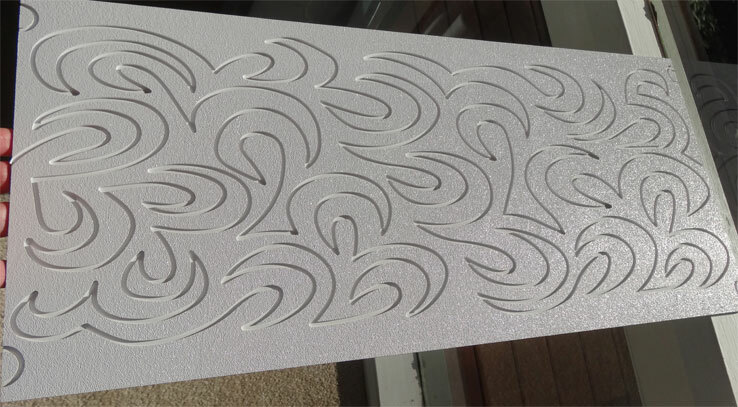 Here's the printed panel on it's own. I love the bright colours - just couldn't resist it! 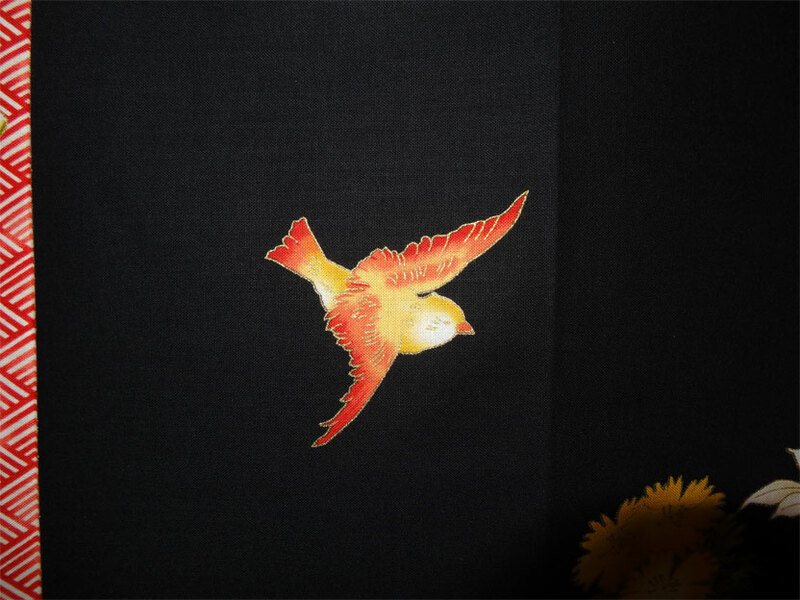 And look at the little bird flying above the flowers. CHARMING! It took no time at all to put it all together - less than an hour, really! I'm backing and binding it with solid black fabric. Now to decide what colour thread to use. At first black seemed the best choice - but then I saw a similar quilt hanging in my favorite quilt shop here in Australia - and that one was stitched in gold - GORGEOUS! So gold it will be. 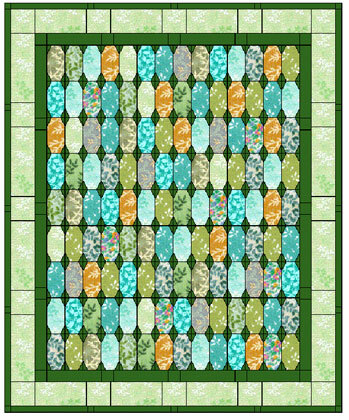 And I'll use the "Baptist Fan" groovy board for the stitch pattern. I'm having a grand time powering my way through my UFO stash - but the truth is that as I make quilt after quilt, well... 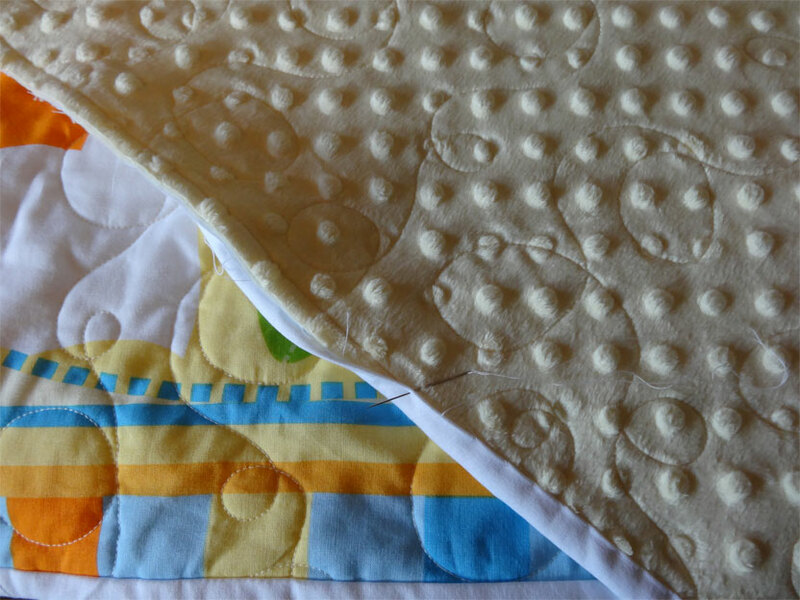 I don't really want or need the quilts. I just want the fun of making them! Many friends have stepped forward to adopt one of my projects, but eventually everyone who wants one will have one. What happens then? 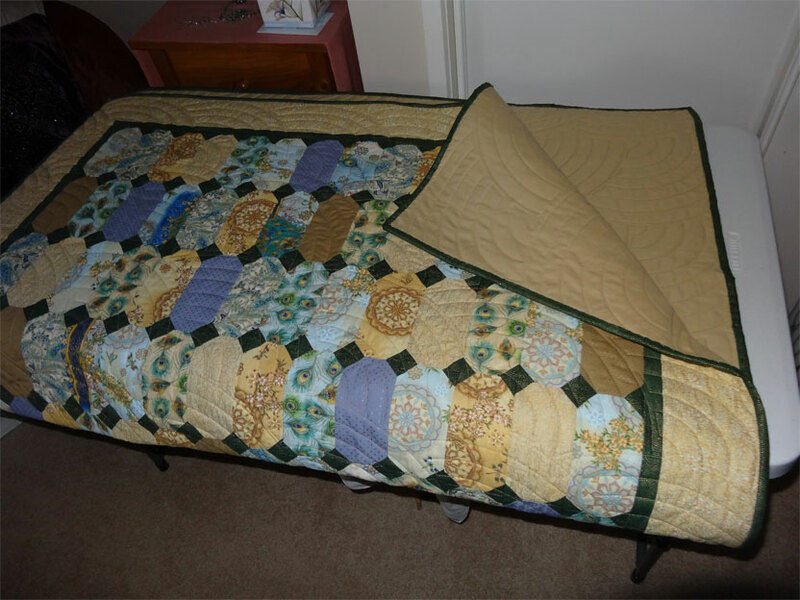 Inspirational Quilts is a registered charitable organization in Victoria whose purpose is to collect and distribute donated quilts to individuals who are experiencing tough times. This includes children at the Royal Children's Hospital, families at Ronald McDonald House and so on. I came across them when I saw this article about Nancy Gheno, the founder of Inspirational Quilts. The article tells her own story of crisis and recovery, and how she came to found the group. One of the things I like about them is the fact that you can "nominate" someone (via their website) to receive a quilt. That can be a family member or friend. 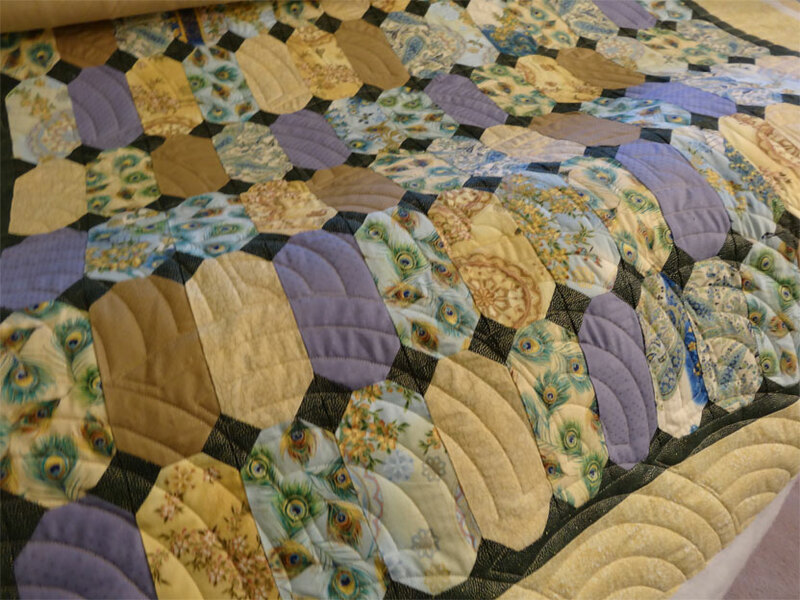 I don't know how many quilts have been given away via nominations, but the idea of that really appeals to me. So I contacted Nancy. We've not met, but we've swapped a couple of emails. 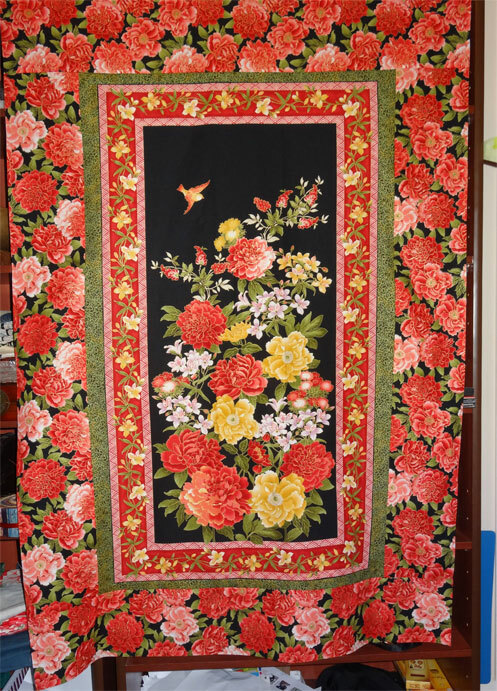 She seems like a lovely person and I'm very excited about the opportunity to contribute some of my quilts. I'm thinking I may set myself a goal of making every 3rd quilting project a quilt for this lovely organization. Heaven knows I've got plenty of material in my UFO closet! 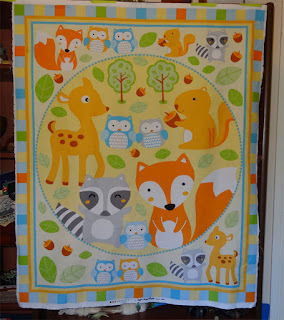 Last week I told you about the animal quilt that Debra, my hair stylist, asked me to make up for her. 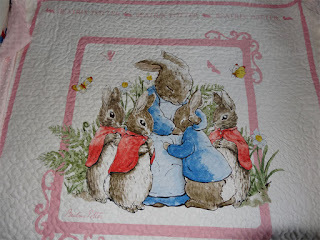 Well - here's the other one - a Beatrix Potter panel she found. She got this dirt cheap at Spotlight and her 2.5 yr old daughter Georgia is absolutely in love with the image. 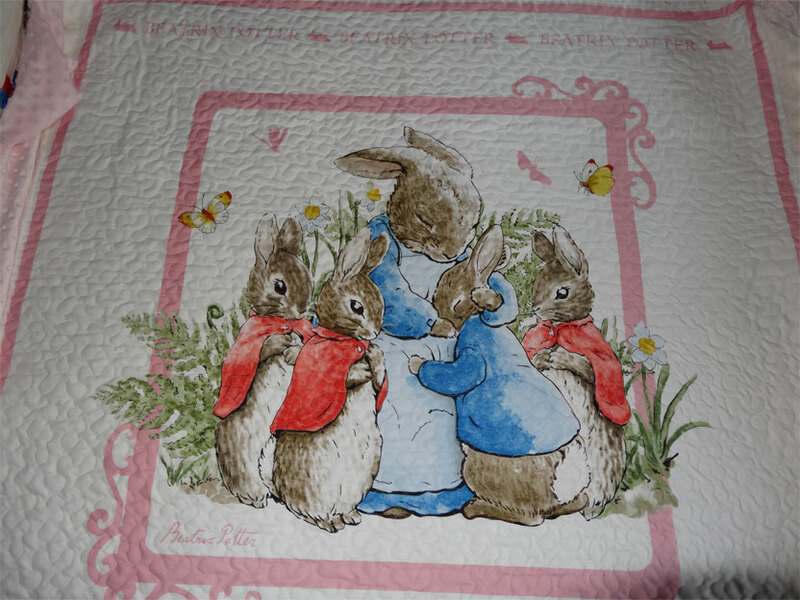 I wasn't as worried about the animal print one (last week's quilt) - but this Beatrix Potter print is so adorable... every time I looked at it I worried I might mess it up. It's a good sized panel - almost 50" across the top. 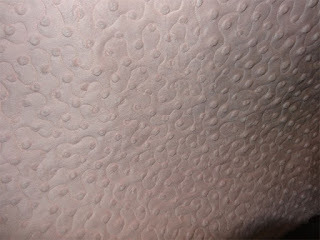 For this one, we agreed on the "Simply Stipple" groovy board design. 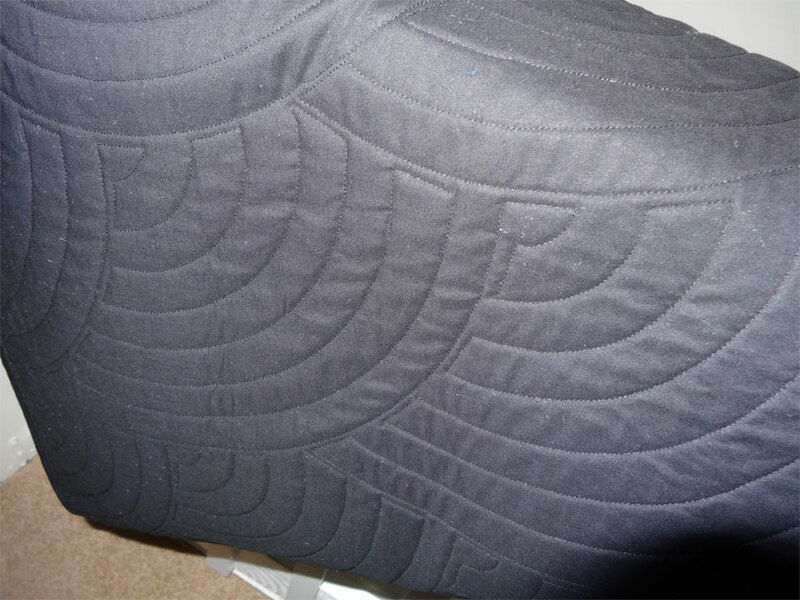 The top fabric and backing are both so very lightweight and floppy, I wasn't concerned about it being too dense. 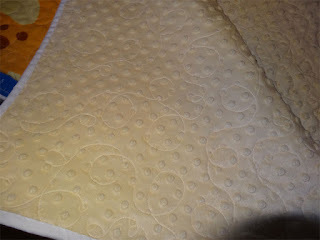 Here's the back - clearly the stippling worked out OK. 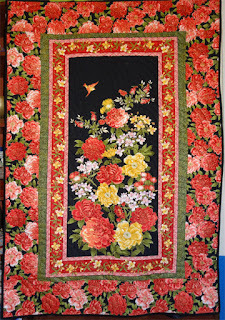 I'm going to do a couple of quilts for my friend and neighbor Anna. 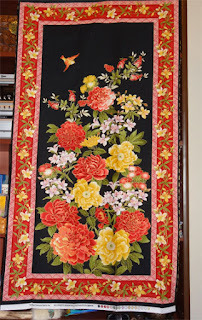 The fabric she bought includes about 3 meters of bright red homespun (muslin). 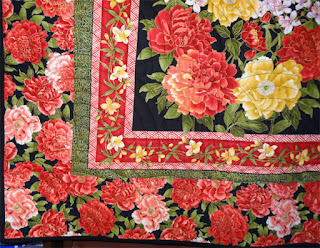 I advised her to wash all the fabric before giving it to me to work on - washing as she would intend to wash the quilts. And I cautioned her to was the red separately, with something white to check the red for bleeding. 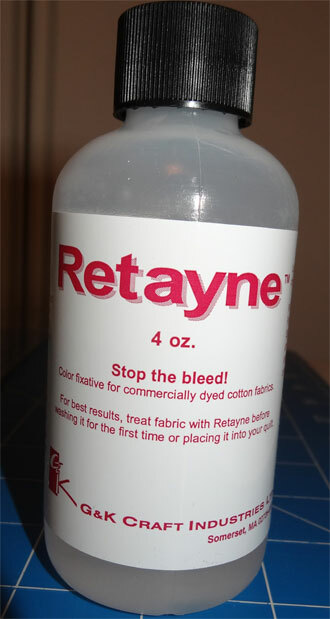 Well, it was a good thing she did it, because the red did bleed a little. 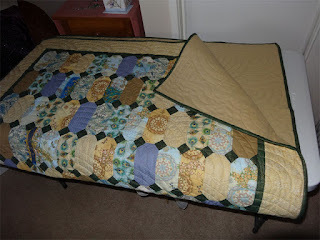 She said she felt it would be OK washed in cold, but I was very worried - as that quilt is going to her grandson. His mum could certainly be counted on to wash it in cold, but eventually he'll grow up, move out, and do his own laundry. 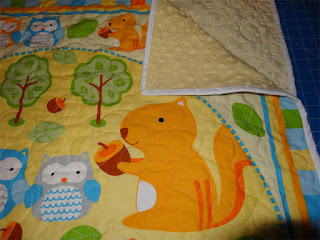 If he loves the quilt as much as Anna thinks he will, well, tragedy looms in the future, yes? So I did some research and found a product online which is supposed to stabilize dyes such as that in the cotton we bought. It arrived, I tried it and.... YES! IT WORKS! with a "sacrificial white facecloth". The facecloth is still white - a miracle! Debra owns the hair salon in my village. I've been a loyal customer ever since moving here. She is, frankly, fabulous and so are all the women who work for her. 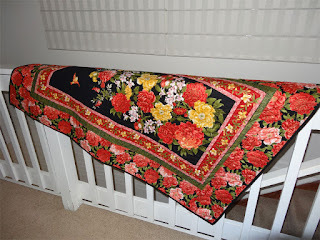 When she had her first child, the lovely Georgia, I happened to have a baby quilt I'd made, but nobody to give it to. Debra graciously took it and loved it (she's told me so every time I've seen her ever since, and folks, It's been a couple of years...). She's expecting her second child now (who I'll go on record as predicting is male). 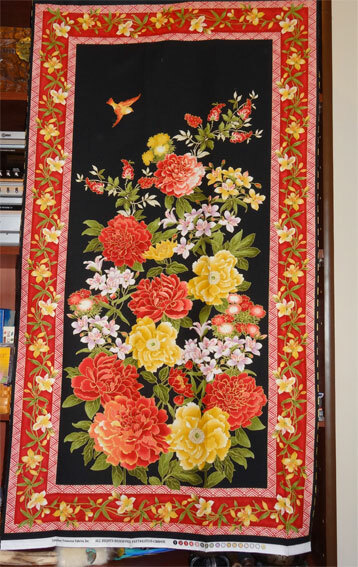 She asked me if I'd consider looking at a fabric panel she bought - something she'd like to have a quilt made out of. Actually... there were 2 panels... and I said "sure". 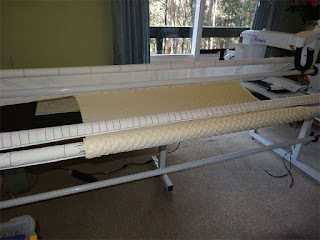 When I talked to Debra, I warned her not to buy any fabric until we talked, as I want to avoid fabrics with a nap, fabrics which stretch, stripes, plaids and so on. But the horse was already out of the barn. She'd bought some very stretchy, fuzzy (nap) fabric for the two panels she had. 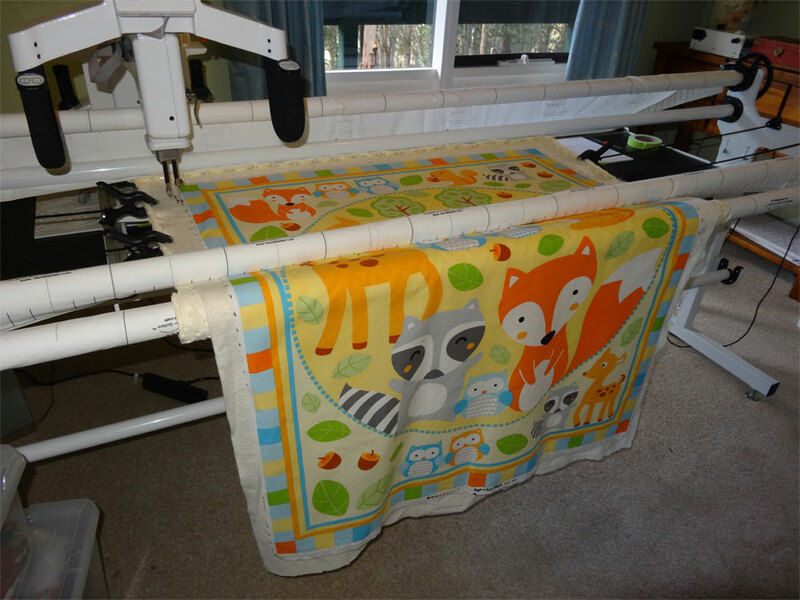 I groaned... mounting stretchy fabric on the longarm? Could it be done? But then I saw a baby quilt made with the same fabric at my favorite shop (a model) and so knew it could be done. It took a couple of weeks to muster my courage, but I finally did. OMG... do you see the stretchy stuff here.. .and how it's bowing inward? I talked with Debra frankly - explained I was happy to give it a go..but I might make such a mess that neither the panel nor backing would be salvageable. Debra wasn't the least bit concerned, expressing total confidence in me (Oh... heaven help me... feel the pressure??? I did). 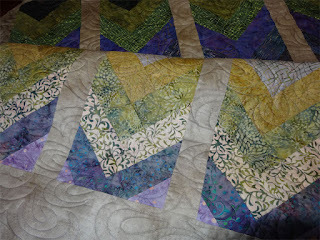 swirls and curls, rather broadly stitched to avoid making the quilt stiff. It all went fine - much easier than I expected. 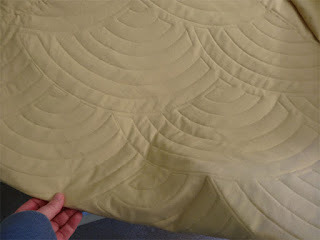 The total time to finish the quilting was about an hour and here (below) I'm finishing the binding (plain white homespun). And here's the back - -where you can see how loosely I quilted it. Of course it is a baby quilt, so the batting is 100% cotton. I hope it will stand up to washing. 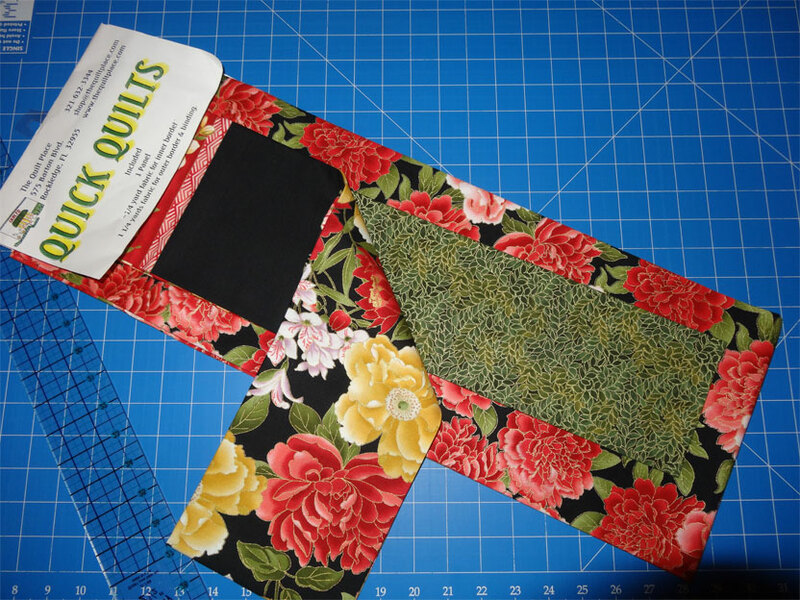 Stitching from the backing side. And here's the finished product (or part of it, anyway). When I delivered it to Debra, she expressed absolute delight. I'm so glad she's happy with it. There's yet another panel to do - a very "girly" Beatrix Potter print. Having done this one, I'm more confident I can do justice to that one. 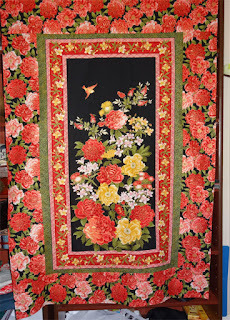 I was quilting away last Sunday, making great progress on a project, but the thread kept breaking. Happily, this was on a project where the stitching won't show up tremendously if there's a "blip" where I re-thread and restart (which I'm getting better at - my "blips" are almost invisible... almost). I'd just finished re-threading and stood up - when I did I bumped the hand control underside a bit - and when I did that - the machine shut off! I stood there in shock. WHAT HAPPENED?!?! I went around the back, turned the off/on switch a couple of times - no response. Checked the user manual, which advised checking all the power cords and make sure nothing had come loose. I did that - no, the power cables are all in place. It was a bad moment. Stood there just not believing that this machine could actually be broken. I went into my office and quickly sent a panicky email to Howard, the dealer I bought the machine from. I was sick at heart because the day he delivered the machine, he told me he and his partner were planning a trip to Hawaii.. for September! Well... it's September. 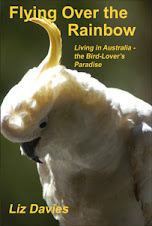 If Howard was into his holiday, I didn't know who I could get to come and have a look. Within half an hour - Howard replied! Yes, he's in Hawaii. Having a great time. And he advised me to try pressing the red button under the front handle (there are handles on the front and back). So I rushed in to look - here's the handle he's talking about... I don't see a red button. Oh, but wait... UNDER the handle... here it is! I tapped it and, sure enough, the machine turned back on. And can you believe Howard?!?!? On holiday in Hawaii, and he's replying to customer emails. I'm going to have to think up a nice way to say "thank you" when he gets back. I'd originally thought that aqua was the way to go - but went to my fav. 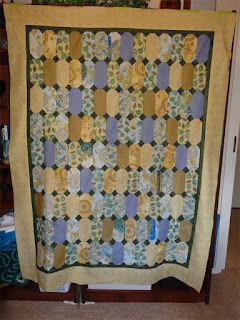 fabric shop and found exactly NOTHING which worked, so ended up bordering it in gold. As it turns out, that's exactly what my friend Lil (who will be getting this one ) prefers. So there you are.. problem solved. 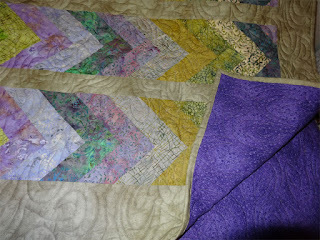 And, yes, with the gold, you see the lavenders and golds in the prints... and the turquiose/aqua's actually pop! So now we're ready for the quilting. I've opted to use my new "Baptist Fan" groovy boards. It seems the most appropriate design from the options I have at the moment. But... well... I'm a bit intimidated by the Baptist Fan boards. Maybe I'll procrastinate a while, build my confidence, yes?